I love to review products! Here you will find my honest opinion of things that have been sent to me! In chapter 12 of this book, Abby says, "God is a great choreographer, isn't He? As I take a hard look now at that fateful day......I see how perfectly He had positioned me so that when my eyes were pried open by His fingers, I'd have the clearest possible view". This book is about Abby's eyes being opened to the reality of her occupation after spending years defending her life's work. 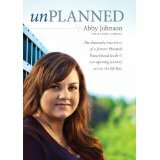 Abby chose to walk away with dignity from her position at Planned Parenthood after He opened her eyes. She talks about how God is in the business of changing hearts and minds and opening eyes; He then uses these ordinary, everyday people to accomplish His extraordinary purpose! God used Abby's story to reach out to an untold amount of people who saw it on the news, read stories on the internet, and heard her radio interviews. I pray my eyes will be open to the calling of God just like Abby. I am a Jesus lover. I am a wife. I am a mom three ways (by marriage, birth, and adoption).